During data collection, incoming images are loaded and displayed automatically, but only if the "Image"-window is up. Keep view Ctrl+v Keep same aspect of image and color scheme when loading new images. The choices in the "Zoom Options" submenu affect the way the image looks at zoom factors < 1.0. If one pixel on the monitor corresponds to more than 1 pixel (N pixels) in the image, image colors can be calculated in several ways. Please note, that "N'th" pixel mode is faster than others since it doesn't involve computation. Table 4: The "Image Toolbox"
Press the left mouse and drag it to another position in the image. When the mouse button is released a window pops up showing the cross-section through the corresponding part of the image, i.e. a plot of pixel intensities starting at the position where the button has been pressed and ending at the position where the mouse has been released. In the image itself a red line will be drawn describing the trajectory. If the area displayed in the window is magnfied (zoom factor >= 1, marked in the upper left corner of the display area), the coordinates of the mouse position and the intensity of the corresponding pixels are displayed in the lower left corner of the display area. Otherwise, the corresponding information is displayed in the upper left corner of the display area and, in addition, a box sized 50x50 pixels centered around that coordinate is integrated. The minimum, maximum and summed intensities are displayed in the upper right corner of the display area. A red box describing the contents of the box is drawn in the image area itself. If the area displayed in the window is magnfied (zoom factor >= 1, marked in the upper left corner of the display area), the displayed portion of the image is recentered around the coordinate of the mouse position. Thus, one can move around zoomed areas of the image. If zoom factors are smaller, than you can drag the right mouse button. A rectangle will be drawn in the image. If the button is released, the contents of the rectangle will be displayed. Depending of the size of the rectangle the corresponding zoom factor will be used. To increase and decrease the magnfication of the displayed part of the image, use the corresponding buttons with the magnification glass showing the "+" and "-"-sign. When pressing the middle mouse button in the image area, the [x,y]-coordinate, intensity and resolution of the pixel under the pointer is displayed. 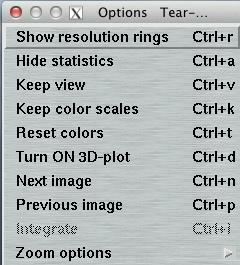 When pressing the "Integrate"-button in the Options menu the following information is displayed: number of pixels in x and y, maximum, minimum, average, sum and standard deviation of pixel intensities, average background and mean intensity over background (all relative to the pixels displayed in the image area). The background is calculated from a histogram of intensities of a box of 50x50 pixels around the center of the zoomed area. Pixel values > 1000 are excluded from the histogram. Integration is possible only for zoom factors > 1. The "Files"-window can be accessed by selecting the corresponding choice in the "Windows"-menu or by pressing the "Ctrl+f"-key while the pointer is in the "Image"-window. From here, you may manually load images. When the window pops up, the contents of the current working directory are listed in the file area of the window. By double-clicking a file, the corresponding file will be loaded. A single click will transfer the string of the selected file to the "Selected File:" area of the window and you will have to press the "Load"-button to actually load the image. 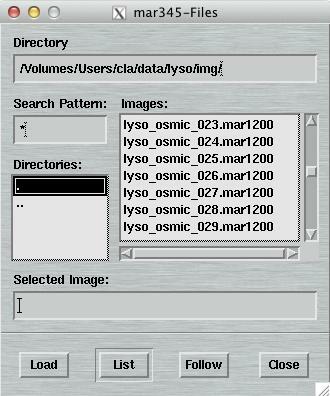 By pressing the "List"-button, the directory is searched and files matching the "Search Pattern" are listed. By pressing the "Follow"-button a series of image files will be loaded. Image numbers will be continuously increased. The "Colors"-window can be accessed by selecting the corresponding choice in the "Windows"-menu or by pressing the "Ctrl+c"-key while the pointer is in the "Image"-window. From here, you may manipulate image colors. 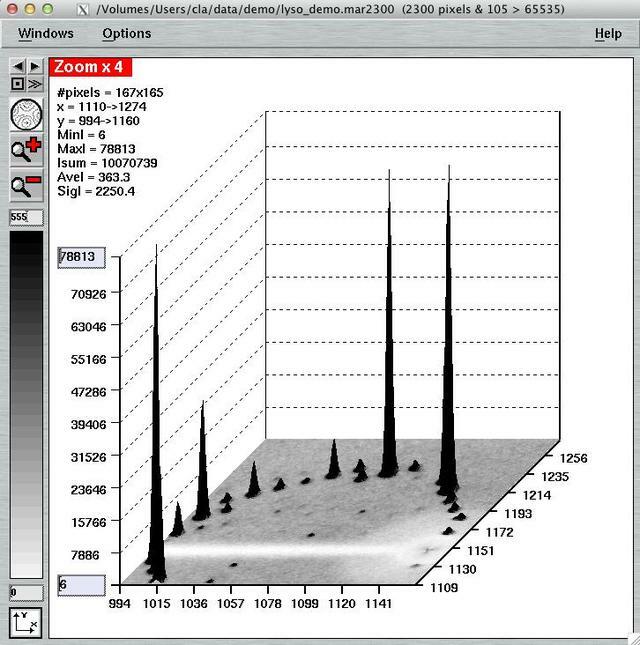 The continuous red line in the plot shows the frequency of certain pixel values in the entire image, i.e. an intensity histogram. The maximum frequency is normally something like the average background or the "most frequent" pixel value. 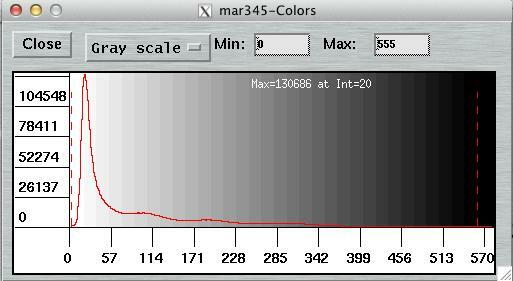 In the histogram, two dashed bars mark the Min and Max values. To change Min or Max, enter values in the corresponding fields (and press RETURN!) or move the left or right bar using the left or right mouse button, respectively, and wait a moment until the image is rescaled accordingly. When loading an image, the program automatically distributes grey scales in equidistant intensity bins between a minimum (Min) and maximum (Max) value. All pixel values > Max are drawn in black and all values < Min in white. Min usually is 0, but Max is calculated such that 99.998 % of all pixels in the image have intensities <= Max. The Max and Min can be entered in the upper part of the "Colors"-window or in the upper (Max) and lower text (Min) text field of the toolbox in the "Display"-window. A 3-D representation of a portion of the image can be obtained by selecting the "Turn ON 3-D plot"-choice in the "Options"-menu or by pressing the "Ctrl+d"-key while the pointer is in the display window. This option works at zoom factors > 4 only. It dumps some statistics of the displayed area in the upper left corner of the display area. The aspect of the peak to be display may be altered by entering a minimum or maximum threshold in the corresponding fields of the vertical axis. As in the regular image area, the right mouse button may be used to recenter the peak. This is a little bit of trial and error but once you get used to it, it works. You may switch between 3-D and regular display any time by pressing Ctrl+d. No. of peaks Specifies the number of peaks between two dashed lines in the plot area of the window. Use the arrow buttons on the right hand side of the fextfield to increment or decrement the value by 1. When pressed, the real space cell constant is calculated from the distance between the two dashed lines and the number of peaks. The result is displayed in the message area. Message area Shows the coordinates of the start and end of the line, the angle with the base line, maximum, minimum, average and standard deviation of the intensities along the drawn line. When changing the no. 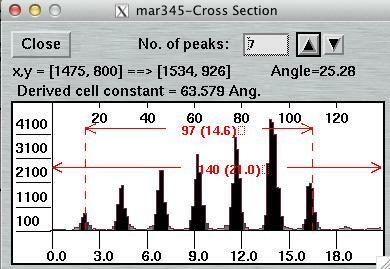 of peaks manually, the second line displays the derived cell constant. Plot: left dashed line Marks the beginning of a measured distance. This line can be moved using the left mouse button. Plot: right dashed line Marks the end of a measured distance. This line can be moved using the right mouse button. Plot: horizontal red lines Show the total length of the line in pixels (mm) and the distance between the dashed vertical lines. The pointer can be used to measure distances by setting the red dashed lines to the desired position along the drawn line. 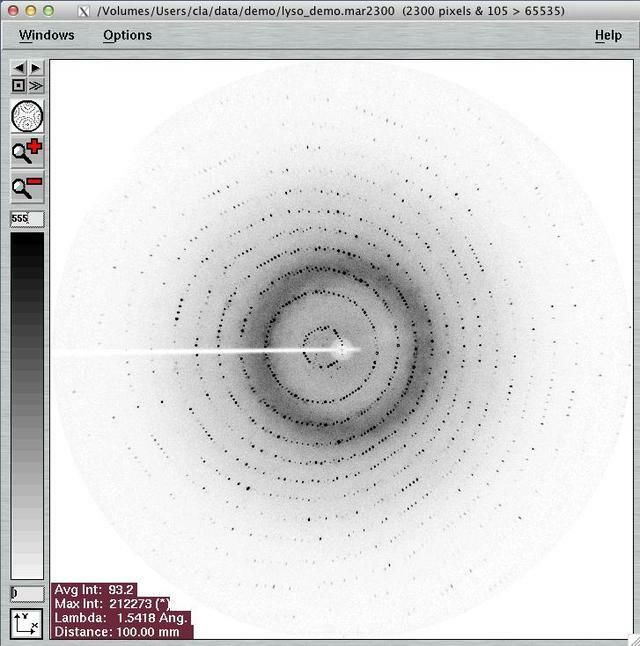 This is particularly useful if you want to measure cell constants. The program features a peak finding algorithm which tries to set the bars on top of the first and the last peak of the plot. Inbetween the peaks the program then looks for other peaks and tries to calculate the best inter-peak distances by assuming a harmonic oscillation. The no. of peaks calculated by the program is displayed in the "No. of peaks" textfield. Of course, this value can be modified. The derived cell constants do not take into account any particular setting or symmetry of the crystal but calculates cell constants assuming plain orthogonal axes.